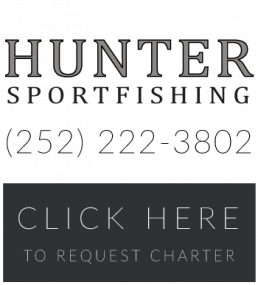 Hunter our 50 foot sportfishing boat has capacity for 6 people and is equipped with a blanket fishing license to cover everyone on board. We have a professional crew to take care of your needs. Our equipment includes Shimano Tiagra 50s and 80s, Shimano TLDs, Garmin chirp depth finder and everything necessary for a great day of fishing! 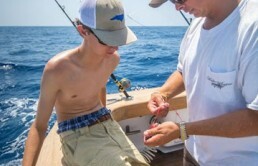 Inshore fishing for Spanish Mackerel, Bluefish, False Albacore, and King Mackerel. This trip stays in sight of land and is perfect for young kids or those new to fishing who are getting a feel for the ocean. The Hunter leaves at 6:00 am and returns at 11:00 am. There are also nearby restaurants that can prepare your catch for lunch! This trip heads out to the wrecks and rocks 10-30 miles from the Beaufort Inlet. 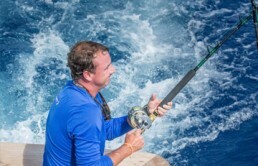 Targeting King Mackerel, Amberjack, Barracuda, along with other assorted wreck fish. Bottom fishing is also an option on this trip, catching Black Sea Bass, Porgys, Snapper, and Grouper. We leave the dock at 6:00 am and return at 2:00 pm. Offshore fishing at its finest! 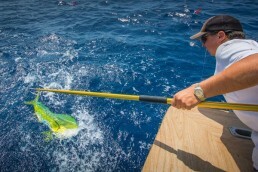 Head out to the Gulfstream in search of Tuna, Dolphin (Mahi-Mahi), Wahoo, Sailfish, and Marlin. 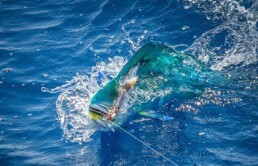 We typically run 30-50 miles offshore and fish the Continental Shelf and beyond. This trip leaves at 5:30 am and returns between 4:30 and 5:00 pm. Have something else in mind? Contact Captian Alan to discuss a custom trip to suit your needs. Whether it be an evening cocktail cruise or a relaxing trip to Cape Lookout, give us a call. Whether you’re venturing out for a half day inshore trip or heading to the Gulf Stream for a full day of fishing, here are some items you won’t want to forget! We’ll cover bait, tackle and ice. 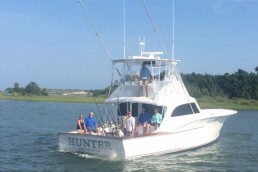 Cancellations must be 2 weeks prior to scheduled fishing trip in order to receive full refund. In the event of bad weather we try to reschedule if possible or refund deposit. If there is a mechanical failure with the boat or we have to cancel for any reason we will provide a full refund.